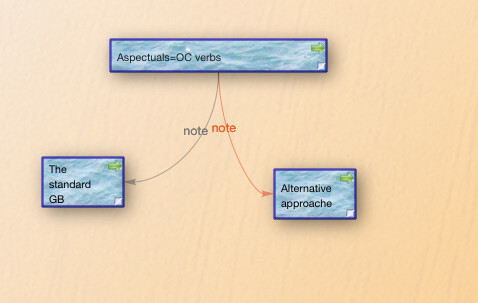 Type [ TB pops up the list of notes which can be linked. I am basically requesting the cool simple linking feature of nvALT. In nvALT, if you type [ and K, all the notes starting with the letter K will pop up. I can just select the note I want link it (insert it as text) in my note. So fast and simple way of linking. The linking in TB is also nice. but, I think, this one improves it alot. This is supprted aleady in the link tool. In main view drag a link to the parking space or in the text pane select some text and clikc the text pane parking space. Typing in the destination box of the pop-up will autocomplete with existing link names. This is an alternate approach to WikiLinks, augmented with autocomplete. It might work. I'm not sure it's simpler in all cases, but for simple documents such as those typical of Notational Velocity and its sequels, it's a nice shortcut. For a task one does multiple times in an hour, repeat it probably for hundreds or thousands of times; even the simplest of a further step feels like a pain. I find myself using the linking feature of Tinderbox less and less b/c of the extra steps it takes to link note (the Footnote is much better). So, I think there is an opportunity for improvement in this area. 1. To bring down the Linking window down to the $Text area: so that the user doesn't have to move her hand or her orientation against the screen to reach that window. 2. remove the extra step of asking for Link Type in the outline view (or, give an option to turn that off)...so that linking will be easier and faster. The extra-steps in the linking process make it a bit cumbersome to use the feature more often. I have more than a 1000 notes in nvALT. Most of them are linked together, mainly due to the simplicity of the process. In TB, I linked a couple of notes in the beginning. I then stop using it because of the extra step. (I find myself using the footnote feature more often). If Note Three is in focus as in your screen grab, why are you using the link park on the tab bar and not the more efficient use of the link tool on the text pane (to the left of the title)? Once you've set the desired target in the link pop-up you can hit Enter to accept the defaults. To make an NV link you'll still use 4 keystrokes to type '[', '[', ']' and ']'. I'm unconvinced TB links are hard to make. Doesn't NV have any export mechanism that preserves its links? Why not export the NV data already linked to make it easier to import to TB. If the real issue here is the one-time task of migrating NV data to TB, there are probably better ways to do this work, e.g. via action code. But I feel it is a bit harsh to say TB linking is 'hard' simply because it doesn't ape NV. If the real issue here is the one-time task of migrating NV data to TB, there are probably better ways to do this work, e.g. via action code. Hi Mark. The issue is not on the migration. I am actually able to get the links if NVAL in my Tinderbox, via Simplenote (thanks for the improvements made in TB in the latest updates---I used to have a lot of issues with the syncing; now,most are solved)---the links work perfectly (they open the note in nvALT when clicked). About the Parking, I am not actually clicking the icons; I typically hit the keyboard CMD+Shift+L---is there any other choice to it? But I feel it is a bit harsh to say TB linking is 'hard' simply because it doesn't ape NV. It is not hard actually, it is very effective-- you are right. My suggestion is, it can be even better. If the suggestion turn out to be useless, well, it can be just ignored. My intention is positively contribute to the growth of TB; not blaming anybody. And, thank you for your fast reply. I see, but note that Cmd+Shift+L is the park link command. As commanded, it creates a basic or text** link stub, and places the stub onto the doc window's tab bar's link park. It also pops the link park's link pop-up on the assumption you may wish to complete the link by typing the target note name (for which autocomplete is offered). ** The sort of link stub generated depends on whether there is a text selection in the current note's $Text. The link creation pop-up is a standard step for all link creation (except via action code) and allows keystroke quick completion: press Return to accept defaults and complete the link, or Escape to cancel the link and close the dialog (the current stub remains in the link park). But, if there is selected $Text and the selection is the exact (case-sensitive) match of a note name, Cmd+Ctrl+L will create a a new link to that note (always of 'untitled' link type). The note menu also shows a suitable caption. Thus if you are in the text of 'Note Two' and wanted to link to 'Note One' and had text "Note One" selected, the note menu would show an active item" Link to "Note One". Otherwise the item is greyed out and shows 'Link to selected text'. Note that a text selection of 'note one' would not work to invoke this feature as the matching is case sensitive. The link type is not set as this is designed for fast wiki-style linking and it is assumed the user will customise the link after creation if needs be. I think it is this last feature, the Cmd+Ctrl+L linking, that you're after. I'm sorry it didn't spring to mind in my previous answer - TB has so many features, those less used drift from mind (thus the vade mecum of aTbRef). Thank you Mark. That was very helpful. Now, I am understanding the links better. One more question, is there any rescue associated with using the Footnote? Do they have any different behavior than the standard links? I am using them a lot. They seem to link in two directions; I usually delete the link pointing upwards to get the mind map effects. Since I don't understand them, I sometimes worry if they have detrimental effect when I attempt to export my notes latter. As far as I know (i.e. have tested) there is nothing special about note/note+ links. The differing names were a convenience to help the Map-based user to tell the footnote from its source, as the link labels show in the map. It also helps tasks like yours - of deleting the right link when weeding the back-links from footnotes to their source. Source->footnote is 'note', the reverse is 'note+'. The special link types can also help in queries and actions in filtering out (or finding only) footnotes. Certainly, if you use ^basicLinks^ in an HTML template, both a source and its footnote will export their link. As to the naming of the link types, I don't think there's anything special. For those with a copy of "The Tinderbox Way", see Ch.8 and the section "Formalization and Link Types". One can see a very small sub-set of Trigg's type listing in the TB's defaults. But, as you're probably ware you don't have to use the built-in types. You can both delete the defaults for your document and/or add your your own. Or, testing in v6.,5.0, you can deleted all built-in types except 'note', 'note+', and 'prototype' for reasons which are hopefully self evident - they may be needed for footnotes and/or prototypes. If the latter seem odd, it is because prototype inheritance is set via a link of type 'prototype' who visibility is disabled by default. In addition most link counts in the app deliberately ignore 'prototype' type links as they're effectively just structural from the user's perspective.